Life isn’t always perfect…so you don’t have to be either! You may think that because I’m a health and fitness pro that my diet is always perfect, that I always cook elaborate healthy dinners, and that I would NEVER feed my kid goldfish crackers or Hawaiian Punch. Life isn’t perfect. Some weeks we have soccer three nights in a row (like this week). Some days I’m just too tired to even push the buttons on the stove. Sometimes I just don’t give a $hit. I used to give up when life threw me curve balls. If I came off my "clean eating plan" for a day I'd feel like a failure and it would take months to get back on track. Then I realized that life isn’t always perfect. In fact, it will NEVER be perfect. So I don’t have to be perfect either. I do the best I can with what I have and move on. As I approach the end of a busy week (and our third evening in a row of soccer practices and games), I'm running out of dinner ideas and patience. But I've learned to keep a few "tricks" up my sleeve for just this type of situation! When I was a kid one of my favorite meals was soup with a good old grilled cheese sandwich. For my mom it was a fast and easy meal that she could get on the table in less than 15 minutes. To us it was the ultimate comfort food. But healthy? Not so much. Back then it was a can of Campbell's condensed soup - full of chemicals and preservatives - and the grilled cheese was made with Wonder bread, margarine, and processed American "cheese product". Ewww. There's a better way! A few simple swaps will upgrade this family-friendly and super-convenient meal! Sure I'd prefer to feed my family something besides grilled cheese and canned soup. But this week’s hectic schedule has me setting aside my perfectionist attitude. 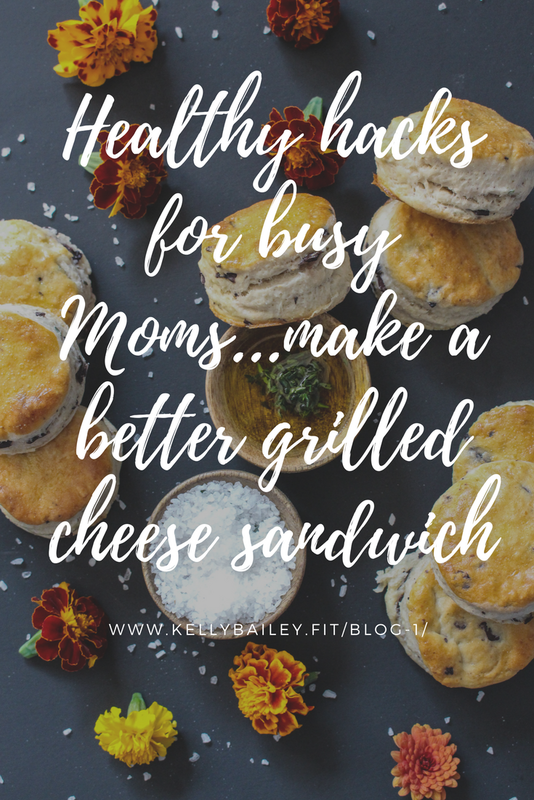 Rather than concede that I’m a failure as a mother and a hypocrite as a fitness professional, I just do the best I can to make a less-than-healthy meal just a little more healthy by upgrading a few ingredients…. Grilled cheese, butternut squash soup (from a can - GASP! ), and steamed green beans. Today there are many more options in the canned soup aisle! Tonight I felt like a creamy soup, so I chose an organic canned butternut squash variety. 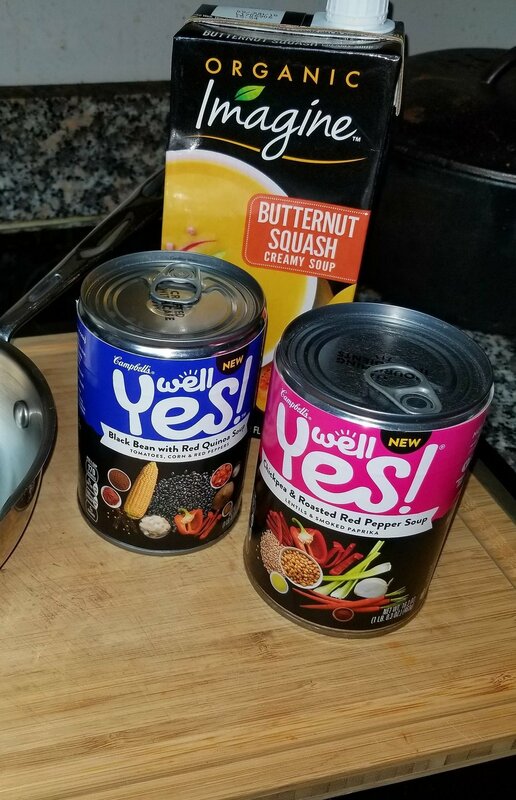 I also love Campbell’s new Well Yes line of soups! I can even pronounce and identify everything on the ingredient list as FOOD! Tip: If you are going to use canned soups – which is totally acceptable when you’re just too busy to make soup from scratch – at least take the time to read the label! Make sure that what you buy contains mostly real food, and few or no dyes, preservatives, MSG, and other chemicals. Tip: Add nutrient density by adding some healthy extras. As you can see in the photo above, I’ve added a small dollop of plain Greek yogurt and some pumpkin seeds to the soup. I also cooked up a side of steamed green beans, which took a whopping 10 minutes, and were ready by the time I had the soup heated and grilled cheese sandwiches done. These additions aren’t necessary and do add extra steps. But I’m all about increasing nutrient density wherever possible, so if you have ten extra minutes (and a bag of fresh or frozen veggies to use), adding a side of veggies or even a salad increases the nutrient density of this meal. You could also add fresh or frozen veggies to the soup as it heats on the stove (this is dependent on the type of soup – I went with a side of veggies because I don’t care for chunky squash soup). Do they even make Wonder bread anymore? Yes, I know...it's fluffy, soft, and delicious. It's also highly processed and loaded with chemicals because the flour is bleached and treated with special substances that keep the bread soft, pillowy, and virtually spoil-proof. Sorry folks...avoid the Wonder bread. Swap in 100% whole wheat bread or sprouted grain Ezekiel bread. I'm particularly partial to the Ezekiel bread. It's dense and has a delicious nutty flavor. And because the grains and wheat are sprouted before baking it's easier to digest than normal whole wheat breads. Sprouted grain breads are also higher in filling fiber and protein than standard white or wheat bread. Next, I used real butter to toast the bread. Please never eat margarine again. Ever. I also used real cheddar cheese. Please never eat processed “cheese product” again. Just trust me on this. Finally, I added a slice of tomato and a few leaves of spinach before toasting the sandwiches. NUTRIENT DENSITY, YO! Can you tell I've been binge-watching the Netflix series Breaking Bad? One of the top reasons that women “fall off the wagon” of health is because they feel like they’ve failed. Instead of simply acknowledging that they are human (and are not, in fact, Super Woman), they give up. Is canned soup and grilled cheese the healthiest thing you can eat or feed to your family? No. But a few simple swaps and a small amount of extra effort salvages this meal and makes it a little more healthy. It is certainly healthier than feeding your family burgers and fries out of paper bags in the car. Don’t give up. Improvise. Do the best you can with what you have. Be a little better today than you were yesterday. Strive for progress instead of perfection. And sometimes, settle for grilled cheese and soup instead of the perfectly portioned Paleo meal that some fitness guru just posted on Instagram. I'd love to hear from you! What simple meal hacks and tricks do you have up your sleeve on busy nights?